Another day in Saigon! District 4 and what to do at night in this city?! Rise and shine on day 3 found us at Cholon - Vietnam's largest Chinatown district, and a much less touristy corner of Saigon, what I was looking forward to in every trip... to be an obvious alien in a sea of locals. This feeling is especially fun for people who love being in the centre of attention, yet not overtly. A bit like humble bragging. 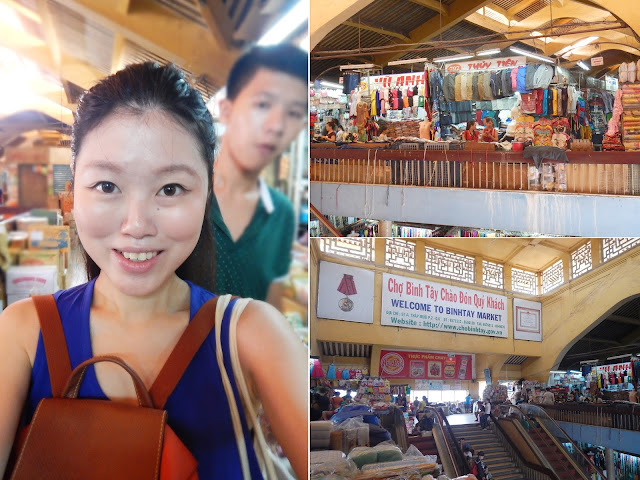 So yes... in Cholon, the must-stop is Binh Tay Market, which was where we went straight to upon touching down in Cholon. 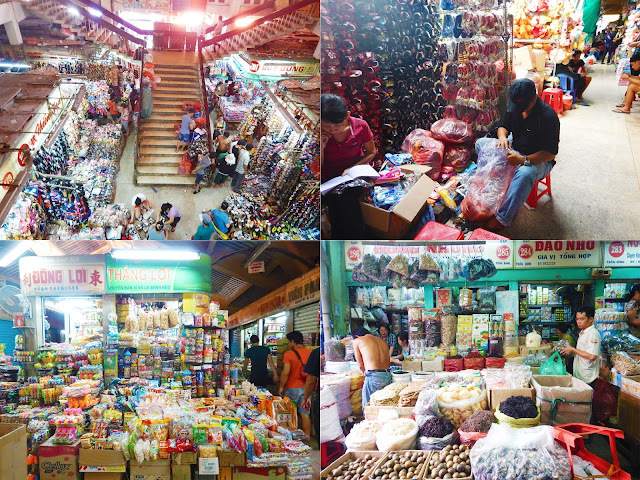 A slice of Binh Tay Market - a humongous marketing selling assorted products in mass and bulk quantities... so much so it becomes daunting and a bit overwhelming! 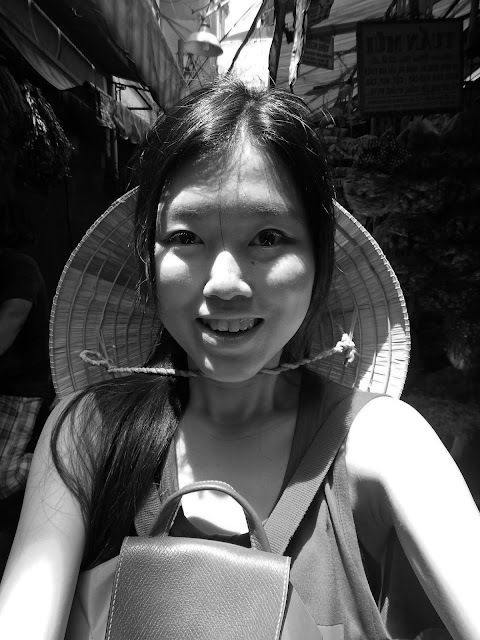 A bit of history on Binh Tay Market - during the Vietnam War (1955), this area was a thriving black market of American Army issue supplies for American soldiers stopping by then. Before that, it was a huge Chinese marketplace. Right now it's just a place for people to stock up on assorted supplies in bulk, probably for businesses rather than personal purposes since they don't really sell in small quantities. Other than snacks, there were bath essentials, shoes (don't bet on the designs), clothes, makeup, stationery, kitchen tools, Japan-Home-ish sort of items... stacked from floor to ceiling, it makes even Mustafa Centre seem tiny. I wouldn't say the shopping factor is huge here even though the variety of items definitely is. More pictures - the corridors are rather confusing and super cramped, making selfies very disruptive for the train of people behind me (I was quick, okay)... stopping by a shop is also quite difficult so most of the time we just whizzed past everything as if we were in a museum. It was a refreshing experience as compared to the sanitized, organized version of Vietnamese markets of Ben Thanh, being able to jostle around with locals. Wear comfortable shoes (ie. no heels) because you don't want extra stress when trying to sidestep the goods spilling onto the corridors. A little breather as we finally exit the market... and off for lunch! For quick bites, there were options of street food and the stalls at Binh Tay Market, but sixth sense led us to Tiem An Nam Long which looked relatively more hygienic for the uninitiated stomachs. Here we had a simple lunch of fried rice, served to us by a very friendly Chinese elderly man and his family. Knowing we were first-time tourists, he introduced District 4 and 5 to us as well as some of the best temples around (we ended up visiting nearly every temple we passed by though). Other than the market, these temples are definitely the highlight of District 4 and 5. They are highly photogenic, makes for a lot of opportunities for light and shadow play. Other than that, these temples are great to understand the Chinese community history of Saigon and their religious ways. 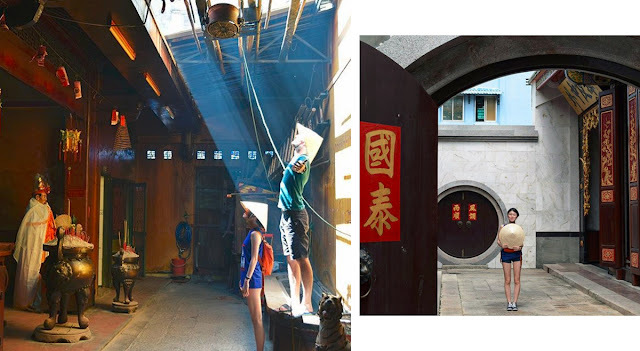 These temples are generally very welcoming to guests and visitors. Wear shoes that are easy to wear too, because most temples disallow footwear indoors. We swung back to District 1 near Bui Vien for another meal in the afternoon because we were hungry... The pho noodles and rice noodles roll here at Gon Cafe are quite average so I'm not going to recommend it in particular, like Tiem An Nam Long it was a choice of convenience. On the 5th floor of the most iconic building on Dong Khoi, Rex Hotel rooftop bar is one of the recommended rooftop bars in Saigon. Chilled at Rex Hotel rooftop bar for a while with an entire stretch of Dong Khoi. Other than the gorgeous view, there is some historic significance of Rex Hotel rooftop bar - American Army soldiers and war correspondents hung out here during Vietnam War. The bar is open 24/7 too. It's quite a breezy place to chill at, though the drinks here are not cheap at all (same as Singapore bars' prices), the good thing is that they don't have as strict a dress code or snobby attitude as Chill Skybar. 'Smart casual' includes covered footwear and pants for guys, but apparently not much of a restriction for ladies since I was wearing a sleeveless top, shorts and canvas high-top shoes. A good representation of how the night went down. She is actually very friendly. Thereafter, we went to Ben Thanh Night Market for dinner! This seafood barbeque platter was pretty good, with some bustling exciting vibes around here and smells really great for meals too. Hundred percent would recommend. There is also Soul Burger around the corner which I wanted to try but there was not enough stomach space. Try it for me will you?! 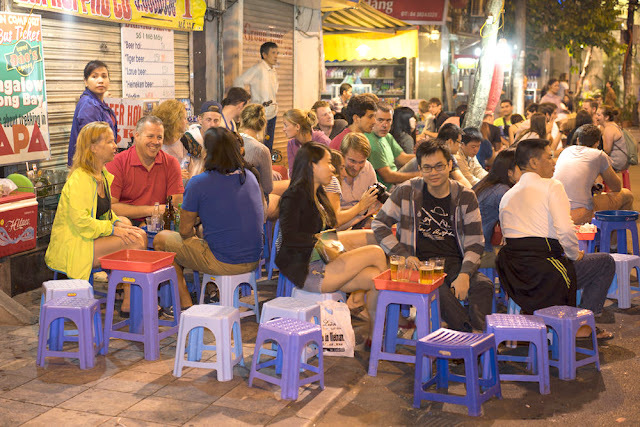 Later in the night we went to a roadside drinking place along Dong Khoi which resembled something like that - much cheaper, only 15,000dong (~S$0.95) for a beer - great place to sedate yourselves properly without burning a hole in your wallet. I didn't take a picture then. Thereafter we swung by Apocalypse Now which is a club of walking distance from Dong Khoi, with awesome atmosphere for a night to dance away at - the lack of pictures to document it is evidence itself. It was rather interesting that Saigon has such an underground, lively night scene in contrast to its stoic, regulated, and calm surface.